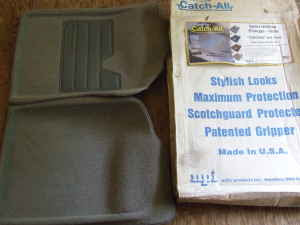 theAdd>>Nifty NPI Catch All Contoured Carpeted Floor Mats with rubber bottom, 97-03 Ford F150, Gray. NEW, in box, NEVER USED. Retail price is $129. GREAT CHRISTMAS GIFT. Catches spills, these will hold about a gallon of water. Can be hosed off easily. $50. Great gift if you know someone has this particular kind of truck, spills huge amounts of liquid AND likes really crappy gifts.